Located at Saint Jean de Luz, in the very heart of the Basque country alongside the sea, the four-star Itsas Mendi campsite welcomes you on a site just 400m from the sea in a friendly family atmosphere. For your seaside holiday, our campsite in Saint Jean de Luz offers an outstanding geographical location near Biarritz, Bayonne, and in the middle of one of France’s finest seaside resorts, Saint Jean de Luz. Situated 400 m from the different fine sandy beaches, throughout your stay you’ll be just a stone’s throw from the perfect spot for sunbathing or simply lounging on the beach with your towel. 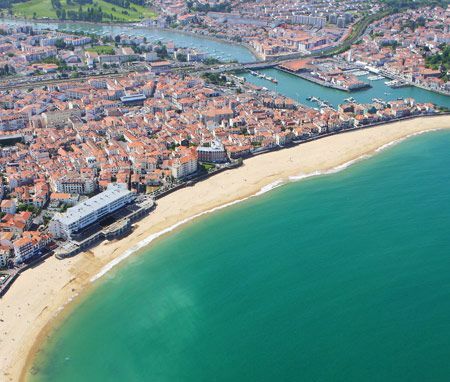 In addition to all the attractions of Basque culture and the friendly atmosphere to be found at the campsite and in Saint Jean de Luz, the site is also a paradise for those who love the sea and water sports! Whether as a family or among friends, come and relax in our campsite in the Basque country, which covers no fewer than 9 hectares of greenery (with 471 pitches). We also propose a huge choice of rented holiday accommodation (with almost 167 rented properties!) carefully laid out to ensure you enjoy a great holiday in the sun, or traditional camping pitches bringing you closer to nature and enabling you to bring your tent, caravan or camping car to create your own little corner of paradise in the heart of the Basque country. Alternatively, our mobile homes for rent mean that you'll never have to bring along anything other than your bags and suitcases, enabling you to get the most from the surrounding area when you arrive at the campsite. For both the mobile homes and the pitches, when you choose a stay at the Itsas Mendi campsite you'll find yourself surrounded by a wealth of activities with many possibilities for trips and exciting things to see and do in the Basque country. During the hot summer days, we propose an alternative to bathing in the sea, to vary your holiday experience. The campsite has not only one but two aquatic areas open to campers! You'll find an indoor swimming pool with a Jacuzzi for a moment of pure relaxation and a relaxing morning bath. The pool with water slide will be a firm favourite with your kids and teenagers, who’ll love splashing about from the moment they arrive. Just a stone's throw from your pitch or fully equipped mobile home, take advantage of this comfortable oasis in the heart of the Basque country with waterfalls, whirlpool baths and lawns for those keen on tanning and relaxing in the sun. To get the most from the leisurely atmosphere here throughout your holidays, our team of organisers are also on hand to propose evening activities worthy of any fairy-tale holiday in the Basque country. Reception is open from 8 AM to 10 PM in the high season and 8 AM to 7 PM (8 PM during Week-end). Although our team are also on hand 24 hours a day. We are at your disposal to provide you with help and advice to the best of our ability. Welcome to the Itsas Mendi campsite! Animations for children and adults, sports fields and events throughout the year! 2 heated indoor and outdoor pools, slides and jacuzzi. Stimulate your spirit of adventure and discover the Basque coast.